Rotary turntable stretch wrappers are a cost-effective and flexible automatic stretch wrapping option for all pallet types. Tackle your toughest and tightest jobs while remaining flexible for your customers with the ability to easily change applications. Small and compact, our conveyorized automatic turntable stretch wrapper can be integrated into a variety to situations and warehouses. 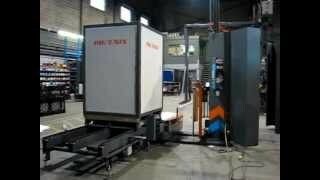 The video shows the PCTA-2000 through a standard wrapping cycle. We’ve worked with many clients to customize this stretch wrapper and make it a seamless part of their operations. PCTA-2000 pre-delivery Q.C. testing just before being shipped to our customer warehouse. Roping reinforces the film to the pallet, in the case of tab folding, holds the tabs to the load more securely than just a film web. This system offers a flexible and economical stretch wrapping solution for up to 50 loads per hour and 4,000-pound weight capacity. 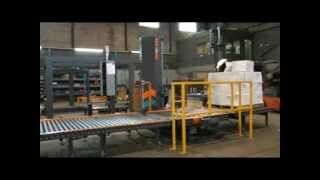 This automatic PCTA-2100 Rotary Turntable was integrated with a Robotic Palletizer allowing very unstable loads to be wrapped as it is being built. 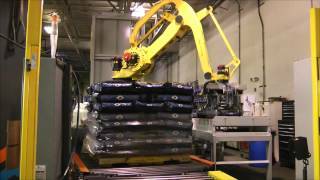 Phoenix PCTA-2100 Automatic Conveyorized Turntable stretch wrapper system, integrated with packaging line Robotic Palletizer. Double stacking of pallets doubles the effective storage area and transport loading density, however, incorrect double stacking and poor wrapping greatly increases the risk of damaging the load. 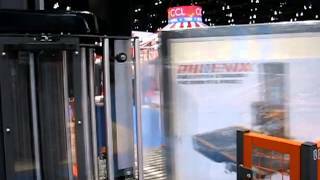 The PCTA-2100 is a fully automatic wrapping machine and requires very little human interaction. At the conclusion of the wrapping cycle, the machine cuts and wipes the film to the load ensuring a clean, secure finish. This video is a case in point. 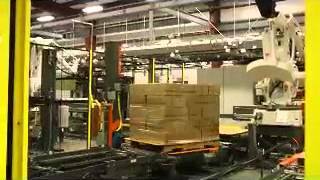 A customer had an automated guided vehicle (AGV) system and wanted to integrate it with two automatic pallet wrapping machines to the end-of-line packaging. 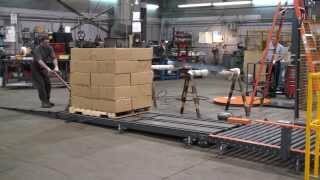 This video features the PCTA-2300 with an integrated top sheet dispenser to give the pallet a five-sided armor against weather, theft, dust and contamination. Commonly used in the brick and block industry, as well as nursery/gardening and pharmaceutical applications, the top sheet dispenser adds another facet to the automatic stretch wrapping process. Pallet loading isn’t an exact science. Depending on the product and application, it’s sometimes difficult to create that perfect well-structured cube. 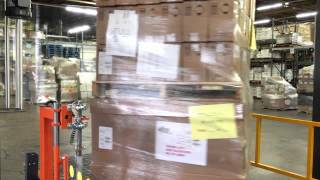 This can be particularly true in distribution centers where pallets can vary greatly from order to order.